Just why does the Inspector have a loaded gun in his drawer? R.M. Cartmel signing at Cafe du Centre. The first of a series of ‘wine and crime’ mystery novels, The Richebourg Affair set in and around the little French village of Nuits-Saint-Georges, following the exploits of the brilliant if slightly crumpled Inspector Truchaud as he deals with thugs, drugs and viticultural villains. You can find the book on Amazon and where all good books are sold. Truchaud returns in the second of R.M. Cartmel’s much-loved ‘wine and crime’ mystery novels. When a young visitor to Burgundy disappears, and two new visitor arrive, families, hearts and inheritances are all thrown into confusion. The Charlemagne Connection is available now on Amazon and where all good books are sold. The third in the Inspector Truchaud ‘wine and crime’ mystery series set in the vineyards of Burgandy sees Truchaud following up a mysterious phone call, with explosive results. 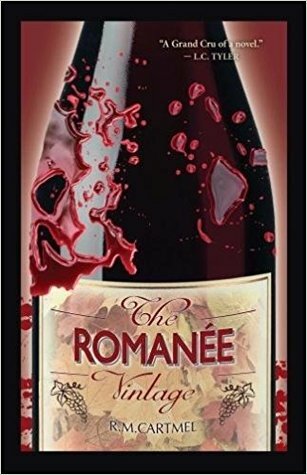 The Romanée Vintage is available now on Amazon and where all good books are sold. R.M. Cartmel’s The Richebourg Affair is a well-crafted treasure of unforgettable characters, eloquent yet whimsical language, intrigues burrowed into the ways of classic French wine making, and vintage murder mystery writing. I felt so comfortable in Cartmel’s hands as a storyteller that I couldn’t believe it’s a debut novel. Whether you are a lover of detective novels, the great wines of Burgundy, or, like me, both, The Richebourg Affair is a gripping read that will have you turning the pages from beginning to end. Cartmel successfully contrasts the intrigue and violence of a murder mystery with the slow-paced, pastoral life of a quiet French village. The small village atmosphere of Nuit-Saints-George starts to come alive, so much so, it becomes easy to imagine sitting at the Café du Centre sipping creamy coffee and munching on sweet biscuits with Truchaud and Geneviève. Readers will know that in the US and other countries, many folks keep guns nearby but, not in this quaint Burgundy village. A very readable story that will take the reader on an interesting tour of French wine country’s best. The Richebourg Affair is a vintage to be enjoyed and R.M. Cartmel leaves the reader eagerly awaiting the next taste. Highly recommended. The Richebourg Affair is a fun read in which the reader is fed tiny nuggets of gold which later lead to the gold mine itself. Win a signed copy of The Romanée Vintage! This is an intelligent and well-researched story by a writer who clearly loves the wines and people of Burgundy. It is a Grand Cru of a novel that will delight both crime fans and oenophiles.